Sophie Cruz, a five-year-old girl, squeezed through security barriers and tried to approach Pope Francis. Security stopped her, but Pope Francis noticed the young girl, and asked for her to be brought to him. Sophie is a child of undocumented immigrants. She traveled to Washington D.C. from Los Angeles, with her father, to hand the Pope a letter asking him to help all American immigrant children. I want to tell you that my heart is sad. I would like to ask you to speak with the president and the Congress in legalizing my parents because every day I am scared that one day they will take them away from me. I believe I have the right to live with my parents, I have the right to be happy. All immigrants just like my dad help feed this country. They deserve to live with dignity. They deserve to live with respect. They deserve an immigration reform. 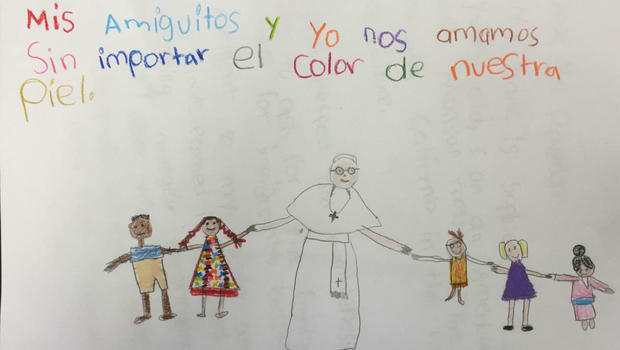 For more on this story, click The Guardian Francis and Sophie’s secret: girl who hugged pope delivers immigration plea. The photo featured in this article was taken by ALEX BRANDON/POOL/REUTERS.